Weather Station members. Some of the sensors for weather monitoring are complicated to use for various reasons and, without the invaluable help from people on the forum - and elsewhere on the web - who are willing to share their knowledge, it's unlikely this weather station would have materialized - at least not in its present form. The weather station is built around "Picaxe" ® Microcontrollers from Revolution Education Ltd and comprises two main units: The outdoor unit, to which the "outdoor weather" sensors are connected, sends its data at approximately 2-second intervals, using a 433MHz licence-exempt transmitter, to a matching receiver in the indoor unit. 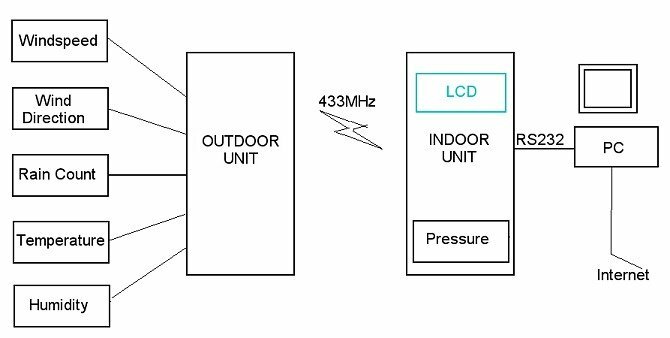 The indoor unit itself displays the received data on a 20 x 4 LCD display along with the barometric pressure, which is measured locally in the indoor unit. I've tried to keep the design as simple as possible while still providing a "usable" weather monitor. Currently, neither unit has any datalogging facilities built in but the indoor unit is able to send the data onwards to a PC via a serial TTL-Level COM Port connection. Software running on the PC currently plots the data on continuously scrolling graphs as well as displaying the values on conventional gauges.The graphs can be dragged backwards in time so providing a degree of 'datalogging'. The graphs and gauges are available to a built-in web server to allow them to be displayed and continuously updated on a remote web page. They are sent over the internet as simple JPG images so no special plugins or other software is required at the remote end. The station has taken several months from planning to completion and, overall, I'm very pleased with the result. I'm particularly pleased that I was able to build everything from scratch myself with normal DIY tools (with the exception of soldering a couple of Surface Mounted chips). It suits my purposes although I suspect it may always be a "work in progress" - particularly with regard to the presentation of the data on the LCD display. A graphical display would look much nicer! I've made no attempt to make the data from any of the sensors compatible with commercial weather station sensors but, if you're thinking of building a weather station yourself, hopefully you'll find some useful ideas as well as noting things that you'll do differently! Most of the material on the following pages was written as I went along. The station has only just been installed outside so it's too early to tell how successful the design will be. I won't be too surprised if parts of it need modifying or re-designing altogether. I'll report back...... Look out for these grey boxes. I've added this note in case you think I've forgotten to make any updates! To my surprise, so far, I've only encountered a couple of problems both of which were early on. I had to replace the humidity sensor which had gone faulty and the wind direction 'vane' worked loose on its shaft a couple of times. Modified the humidy maths in the 'Outdoor code' as it was consistently returning a high reading. Replaced the DS18B20 temperature sensor. Renewed the "CD Case Cover" on the rain gauge (again) as the old one had become brittle. There are outdoor sensors to measure temperature, humidity, rainfall, wind direction and wind speed. The sensors are a mix of mechanical and electronic devices. The following pages show each sensor in detail. Continue to the next page with the link below or jump to details of a specific sensor using the links in the blue navigation bar on the left. This site and its contents are © Copyright 2005 - 2011 - All Rights Reserved.